The list of authors includes two from Minnesota. Judge Gail Chang Bohr writes “A Judge’s Hidden Struggle: Overcoming Judicial Culture” regarding a difficult child custody case. Judge Edward S. Wilson writes about his experience with the United Nations mission in Kosovo where he spent a year helping to build and dispense justice in a region torn by violence, war crimes, homicide, and organized crime. Both authors are retired Ramsey County judges. 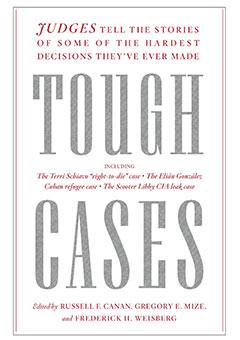 The book contains thirteen personal essays, and some cover more well-known cases such as Terri Schiavo, Elian Gonzalez, and Scooter Libby. The judicial authors weave together substantive and procedural issues and embellish their storytelling with commentary, analysis, and insights about the parties involved. All essays are fascinating to read, they describe what judges wrestle with, and they give an idea of the personal impact on the judges themselves. The book is edited by Russell Canan, Gregory Mize, and Frederick Weisberg and is published by The New Press. The law library has a copy; or you can purchase the book on Amazon for just over $16.00. Whether you make this a special gift for yourself or someone else, the reader will come away with genuine revelations, a better perspective, and satisfaction with time well spent.